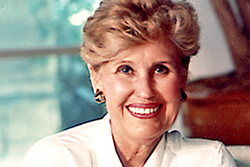 Erma Bombeck&apos;s advice on living well, written after she found out she was dying from cancer. If I had my life to live over, I would have gone to bed when I was sick instead of pretending the earth would go into a holding pattern if I weren't there for the day. I would have burned the pink candle sculpted like a rose before it melted in storage. I would have talked less and listened more. I would have cried and laughed less while watching television—and more while watching life. When my kids kissed me impetuously, I would never have said, "Later. Now go get washed up for dinner." There would have been more "I love you's." More "I'm sorry's"
…But mostly, given another shot at life, I would seize every minute…look at it and really see it … live it…and never give it back.